We have a finite amount of time. However, in the course of a lifetime, the average person will spend 13 years and two months at work. If we’re going to spend that much time doing something, it’s in our best interest to do it to the best of our ability. This article covers 36 ways to improve your work performance and a handy do & don’ts list you can refer back to in order to refresh your memory. Skip right to the infographic here! Meetings are an inevitable part of our work life, for better or for worse. Learning how to make meetings effective will free up valuable time and attention bandwidth for tasks that are more important to your bottom line. First, evaluate whether a meeting is necessary at all. Can you communicate over email or over the phone without diluting your message? If you do need to have a meeting, keep them efficient by setting an agenda, adhering to a time limit, or by making it a standing meeting. 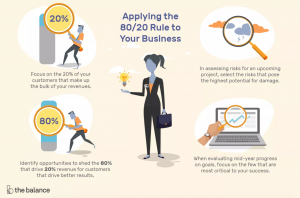 The Pareto principle or the 80/20 rule states that 20 percent of our efforts produce 80 of our results. This means that on average, 80 percent of your efforts are spent on producing things that don’t matter as much to your personal bottom line. How many times have you put off a hard-to-start task only to find out that it wasn’t as difficult to do once you started? If your answer is ‘more than you’d like to admit’, then you’re not alone! Kris Hughes, Senior Content Manager at ProjectManager.com, suggests eating the frog first thing in the morning. He says “If you always tackle your most dreaded or most difficult task first thing in the morning, the remainder of the tasks you have to do throughout the day will pale in comparison and you’ll be able to maintain a high level of productivity throughout, rather than dreading the frog as the clock ticks”. Tackling daunting tasks earlier in the day means that you’ll have a clearer mind than you would have after a day’s worth of work. Hughes also suggests breaking daunting tasks into manageable, bite-sized pieces. 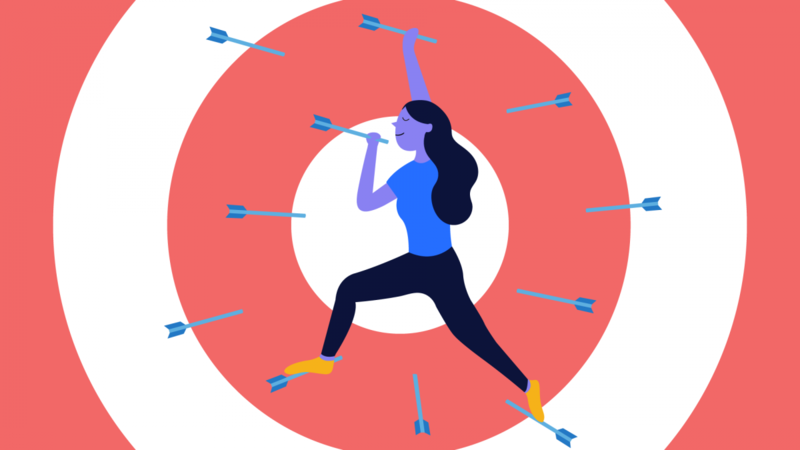 Not only will the task seem less daunting, but getting things done, however incremental they might be in relation to the bigger goal will give you the momentum to get more done. Summary: Break down daunting tasks into smaller tasks and start working on them first thing in the morning. Identify what slows you down or the business down, and figure out ways to improve it. This article offers ways to identify bottlenecks and how to unblock them. For example, if you’re on the road a lot but still need connectivity, identify a solid VoIP app you could use. Summary: Figure out what slows you down and improve or put a stop to it. This can be as big or small of an undertaking as you’d like. 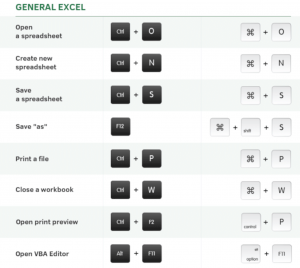 Keeping ahead of trends in your industry or even learning keyboard shortcuts are low-effort ways of improving your work performance. However, if you’re willing to put in more time, consider taking an online course. There are plenty of skills that can help you improve your performance at work, like project management or soft skills. Don’t start working on something unless you have the ability to follow through with the next steps. Doing this will avoid instances where you repeatedly look at paperwork or an email, but push it aside for a later date. 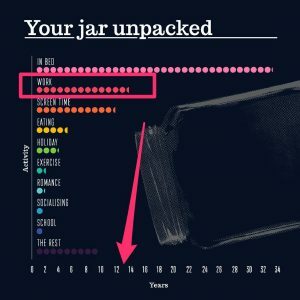 Adhering to the “touch it once” rule ensures that this form of procrastination doesn’t happen and reduces the amount of “unfinished business” you have. Don’t wait until your quarterly- or annual review to get feedback. Ask for it often so you don’t miss out on opportunities of growth and development. When possible, say ‘no’ to the things that aren’t part of your core 20%. We have a limited bandwidth, so when you say ‘yes’ to something unimportant you could be saying ‘no’ to something that matters more. Summary: Say ‘no’ to the tasks that don’t matter (when possible). You’re the average of the five people you spend the most time with. So, if you’re goal is to be more productive or be a better leader, surround yourself with people that have those traits. 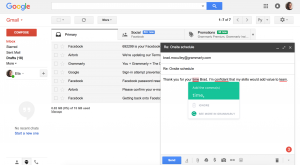 Grammarly and After the Deadline browser extensions automatically correct mistakes like contextual spelling errors, incorrect grammar, or poor vocabulary usage. For more complex proofreading, the Hemingway App identifies long, complex sentences, weak phrases, passive voice, and more. With professionally designed templates available directly through the Evernote app, you can create great notes quickly, without having to start from scratch, figuring out formatting and layouts. Just click the Template button when creating a new note and you can instantly choose from your personal collection of templates. You don’t need to wait until you get the corner office to have an executive assistant. AI assistants Amy and Andrew, created by x.ai, schedule all your meetings for you, saving you the endless back-and-forth that easily drains hours each day. There’s nothing to download — simply CC Amy in an email and she will look at your calendar, email with your guest, and send a meeting invite to both of you. When the content of an email changes, so should the subject line. Where possible, avoid using vague subject lines because it will be a pain for you and your recipient(s) to find. Keep emails short, and to the point. If your email needs more than a couple sentences, than another form of communication (e.g., a call or meeting) may be more appropriate. Our attention spans are finite. Keep distractions to a minimum by turning off notifications (or turning off your phone entirely), stopping “got a minute” meetings, scheduling time to check emails and make phone calls, and wear headphones. If you’re easily distracted, try arriving earlier so you can get work done with minimal interruption. Where you work can make a difference to your level of productivity. Research shows that having plants in the office boosted productivity by up to 15 percent, along with increasing workplace satisfaction. Keep a clean desk and take out only what you need for the task at hand. You will spend less time looking for what you need to and won’t have to look at a cluttered desk. Eileen Roth, Author of Organizing for Dummies, suggests putting away food so people are less likely to come around your desk to chat while they snack. Summary: Keep your workspace organized and clean. If possible, keep a plant or two on your desk. You’ve probably heard of Parkinson’s Law – “work expands to fill the time available for its completion.” Use this law to your advantage by setting yourself personal deadlines, even if your work isn’t time-sensitive. 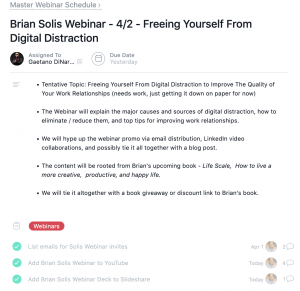 Take solo-tasking to the next level by grouping similar tasks together. This way you can further reduce the mental fatigue that comes with task-switching. If you’re working on multiple projects, but have to sign off on reports, do them all at once. If you’re writing an article, write out the outlines for both at the same time. This is arguably the most important tip on this list. No one can be 100 percent productive 100 percent of the time, and attempting to do so will eventually burn you out. Studies have shown that taking regular breaks makes you more productive. Researchers from the Draugiem Group studied its most productive employees and found that they stepped away from their computers 17 minutes at a time when taking a break. They concluded that it was most effective to work for 52 minutes at a time, then take an extended offline break, like chatting with a coworker or going for a walk. If you prefer working in shorter spurts, consider the Pomodoro Technique. It’s a system where you hyperfocus on work for 25 minutes, and then take a 5 minute break. Each cycle is called a pomodoro. With every 4 pomodoros, you can extended break of 20 or 30 minutes. Josh Spiker, content manager at ClickUp, recommends setting a reminder and timing your breaks if necessary. You can use an app like breaktaker to remind you to move around. The subheading says it all. Avoid idle conversation (unless you’re on a break) or checking social media and the news (unless that is part of your job). Get into the habit of starting work as soon as you sit (or stand) at your desk. Periodically check in to see if you’re actually working towards your goals. It can be easy to get caught up in the day-to-day, so set a weekly or daily reminder to evaluate whether you’re focusing on your core 20 percent. If you find that you’re not working on the important things, do your best to delegate, delay, diminish or eliminate these tasks. There’s a reason solo-tasking is the new productivity buzzword. Studies show that multitasking can reduce productivity by as much as 40 percent. This is because most of us can’t multitask effectively. We’re just quickly switching tasks and that can take a mental toll on us, thereby getting less done. Prioritize tasks you need to get done on a daily and weekly basis to avoid getting caught up with tasks that don’t matter. Aim do this at the end of the work day, while everything is still top-of-mind, so you can hit the ground running the next morning. To take your planning up a notch, you can schedule your day into time blocks. Kris Hughes, Senior Content Marketing Manager at ProjectManager.com, breaks down the typical nine-hour work day into 30 minute increments. After months or years of working in a role, it can easy to lose focus of what you were hired to do. Speak to your manager about what your objectives and day-to-day should look like and prioritize accordingly. Make a list of what matters the most, so when you plan out your day you can refer to it. Also, make sure you own a clear metric or number. This way, it’s your sole responsibility to measure and track that number. “You can only improve something if you measure it” is a popular adage in business. So why shouldn’t it apply to productivity? Track how your day is spent, either manually by time blocking or digitally with apps like RescueTime. Doing this will not only make you more mindful of how you spend your time, but you may also notice patterns in the way you work. For example, if you spend too much time on a task that doesn’t advance your 20 percent, then outsource it. The two minute rule states that you must do immediately any task or action that can be completed in two minutes or less. This rule is best used to push through any inertia you have when starting a task or project. Summary: If it can be done in two minutes, do it now. There are a number of things you can do to improve your work performance even before you get to work. If you get to work by bus or train you can read, watch videos, or plan your day out in advance (if you haven’t already done so the night before.) If you drive to work, consider listening to a podcast or audiobook. G.K. Chesterton, a philosopher, once said “Anything worth doing is worth doing badly”. It’s counter-intuitive, but it’s a good way to approach important tasks. If we wait until we feel we can do something perfectly, we might be waiting around for a long time. It’s much better to go into a task or project, knowing that it may be imperfect but give it our best shot. Summary: Strive toward excellence, but don’t fear failure. According to research published by the University of Illinois, moderate level or ambient noise enhances creativity by prompting abstract thinking. Max Razbo, a web designer, recommends using Defonic for nature-centred ambient noise or Hipstersound to experience the sounds of a coffee shop from wherever you’re working from. In this study, listening to binaural beats improved working memory capacity in the participants studied. There isn’t a whole lot of research done in this field, but if you’re interested in trying something new, you can read on here. People who love what they do are happier to get more done. If you’re not excited by what you do it might be a good idea to rethink what you do. 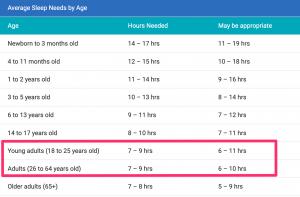 As mentioned earlier, in the course of a lifetime, the average person will spend 13 years and two months at work. That’s a lot of time to spend doing what doesn’t excite you. Summary: If you don’t love what you do, find out what you do love, and do that! Our energy and attention levels spike and decline throughout the day. Generally, our focus peaks before lunch and our creativity spikes when we’re most fatigued. However, each person is different. This article outlines a great way to figure out when your most productive hours are. Once you find out when you’re most productive, start scheduling your day around these hours. For example, if you’re more adept to doing cognitively-intense tasks in the afternoon, try to avoid scheduling meetings around that time. At the end of each week, note down three things you achieved that week and three things you could do better the following week. Tracking your achievements is an excellent way of motivating yourself to do more. Having a list like this is handy, especially if you plan on asking for a raise or job hunting. Our bodies are like engines. If they don’t have the proper fuel and maintenance, they won’t be able to perform to their best ability. Get a minimum of seven hours of sleep, and make sure you’re practicing good sleep hygiene (e.g., no electronics or blue light before bed, sleep and wake up at regular times each day). Keep a bottle of water at your desk and stay hydrated. If you feel like you’re getting brain fog, it’s probably because you haven’t had enough to drink. Eat a balanced diet and avoid keeping unhealthy snacks on your table. Finally, stay active. Stretching, walking, and yoga can do wonders for the stiffness that comes with sitting at a desk for eight hours. Summary: Get enough sleep, stay hydrated and well fed, and get moving. Reward yourself when you finish a project or hit a milestone. This can be anything from chatting with a coworker or buying yourself a treat. Having ‘carrots’ to work towards makes work a little more fun. Summary: Reward yourself for hitting milestones. Don’t let your computer slow you down. Periodically clean up files, sweep the hard drive, and update software. If you mostly work remotely, it may help to have, say, a VoIP troubleshooting guide handy. Summary: Maintain the speed of your computer so it doesn’t slow you down. [BONUS] How Do You Increase Employee Productivity? The points below are things that can boost productivity from the top down. When used correctly, the right software can really make a difference in the workplace. Depending on the size and function of your team, it may be valuable to look into a communication suite like Nextiva. There are plenty of tools out there. When selecting one for your team, make a list of the features you need the most (e.g., Kanban board, chat feature, calendar etc) and pick one accordingly. For office productivity, there are plenty of apps and browser plugins that can do anything from fine-tune the way you use email or manage distractions. Creating a happy working environment has its own intrinsic benefit, but it’s also proven to boost productivity and workplace satisfaction. Instead of waiting for an annual review, schedule meetings with your team members more frequently. This helps establish a better line of communication where you can set achievable goals, discuss any hurdles, and give each other constructive feedback. 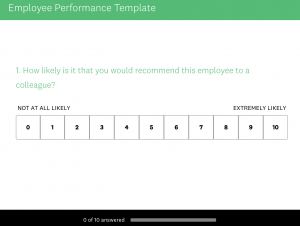 Not only does this help your team stay aligned, but you can also get feedback on ways you can be a better manager. Krystal does all things marketing at GoSkills. She's a recent Boston University graduate with a B.A. in international relations and a minor in communications. When she's not at work, you can find her listening to podcasts or watching comedy specials on Netflix.